The Alberta oilpatch continues to increase oil production, but as pipelines fill up, companies are receiving less money for their oil compared to the rest of the continent. North American oil prices are marching toward $65 US a barrel this month, giving the industry a boost after the market collapsed three years ago. The oil sector hasn't seen these prices since late 2014, but most companies in Alberta are receiving significantly less, just above $40 US a barrel. 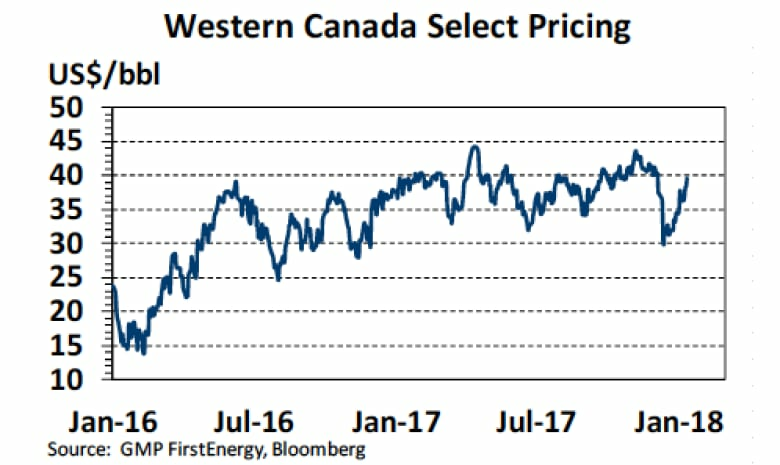 While there is always a gap between the North American benchmark, West Texas Intermediate (WTI), and Alberta's Western Canada Select (WCS), the divide widened significantly in December and opinions vary about how long it will persist. Last summer, the WTI-WCS differential began to spread as Alberta production increased, filling up any spare capacity in export pipelines. When TransCanada's Keystone pipeline was shut down in November because of a spill in South Dakota, suddenly a backlog was created and storage facilities began filling up in Alberta. As a result, the oil price differential widened even further. "That basically pushed the market to where it was going anyway. We were looking at an oversupply situation of total supply versus the ability to get those barrels to market on pipelines. Railing was going to have to fill the role here at some point. The Keystone outage essentially pushed things right to the extreme quite very quickly. A bit sooner than people thought," said Martin King, a commodities analyst with GMP FirstEnergy. "The blowout is the worst since 2014 in terms of the price spreads." Keystone is currently operational, although at a reduced rate, TransCanada said Wednesday. The company did not provide figures for how much oil the pipeline is able to transport, however it was told by the Pipeline and Hazardous Materials Safety Administration in the United States it could operate with a 20 per cent reduction of maximum pressure. King expects the price spread will take time to correct, but says it's already beginning to contract as more oil companies start loading up their oil onto trains. Both CP Rail and CN Rail shipped more oil in 2017 compared to 2016. "We're already starting to see those differentials narrow now, so I think those differentials will come in another $5 to $7 US. The economics of railing suggest you need a spread probably of around $15 to $20 US and the spreads right now are still wider than that," said King. The price gap may, however, persist much longer, according to Judith Dwarkin, chief economist with RS Energy Group. 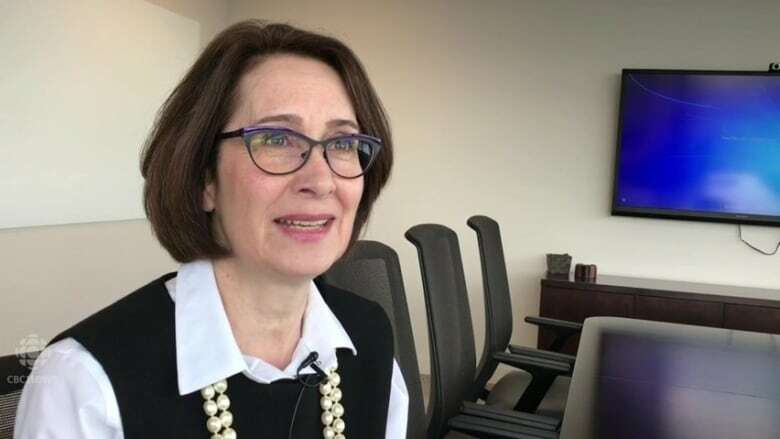 Alberta oil companies could produce at least an additional 250,000 barrels of oil per day in 2018, she says, and the next pipeline export project to be complete, Enbridge's Line 3, could only happen in late 2019, at the earliest. "The spread is likely to look ugly until then based on current expectations for production growth," said Dwarkin. Enbridge is facing regulatory delays in Minnesota for its Line 3 replacement project. TransCanada still needs to make a final investment decision on whether to proceed with constructing the Keystone XL pipeline. The company said this week the pipeline has significant commercial support, but it has not provided a timeline for making an announcement on the project's fate. Kinder Morgan Canada still requires various permits and approvals to construct its Trans Mountain Expansion pipeline. The company is allowed to work at its temporary infrastructure site near the Westridge Marine Terminal and at the Burnaby Terminal in B.C. The company said this week the pipeline expansion could already be one year behind schedule and further delays could threaten the viability of the controversial project. 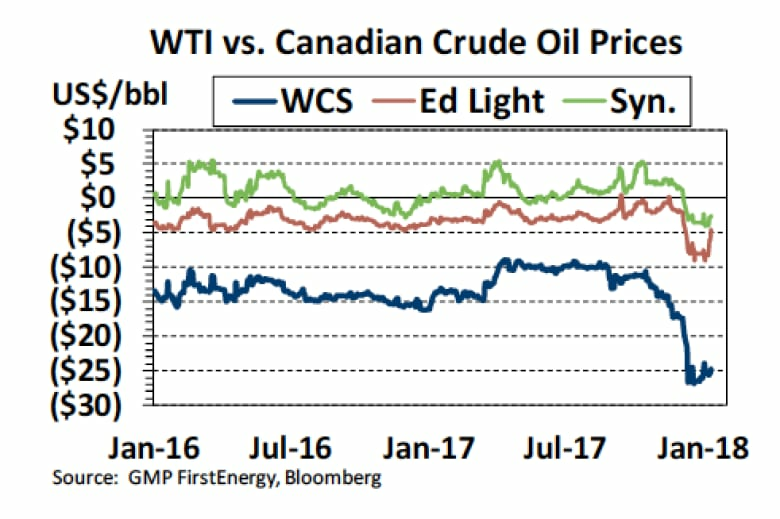 The Alberta government based its 2017-18 budget on a WTI price of $55 US and WCS at about $51 Cdn. This month, WTI is above $60 US per barrel, while WCS is around $50 Cdn.